was busy being a terrarium at party time. to see a blog post I did in January). I decided to let the plants come to the Cloche Party too. left at the top of the cloche. as perches for the butterflies. day re-moisturing process to spread their wings. cheaper and won out...not as pretty but "good enough". Both packs of butterflies were opened. background had items other than butterflies too. were added to the twigs from the yard. the plants, twigs, and butterflies. placed in the living room with a new frog friend. to look more life-like but they were having none of that. around each other in mid-flight...Spring is here! These look beautiful! Love what you did with your Springtime cloches! How clever! I envy your green thumb. Your cloche looks wonderful with the butterflies! You always have the best creative ideas! The butterflies add a special touch...I love them! 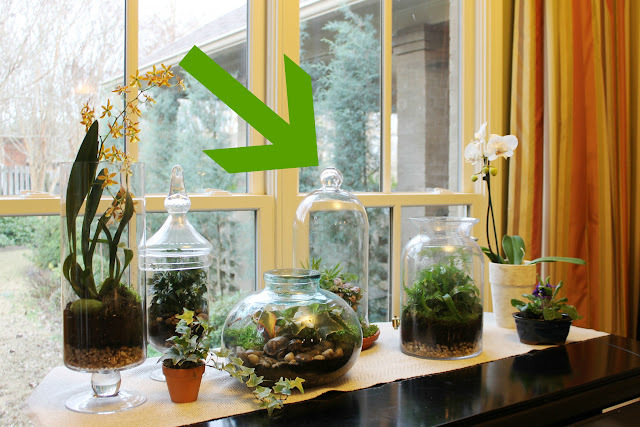 You're inspiring me to try some terrariums! I wish I had a good spot near a window like that! 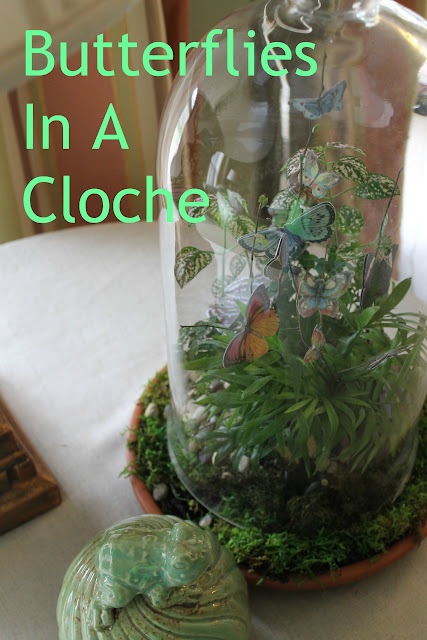 The butterflies are just darling in your beautiful cloche.